On June 27th, 2017, Bai Xiaojun, the Vice-President of Guangxi Normal University (People’s Republic of China), and others paid a courtesy call on the Vice-President for International Affairs at Kumamoto University, Kazuki Takashima. Guangxi Normal University is located in Guilin in the city of Guangxi. Guangxi Normal University functions as a core university in southern China and is a university that has received high acclaim throughout the country with its history and tradition. 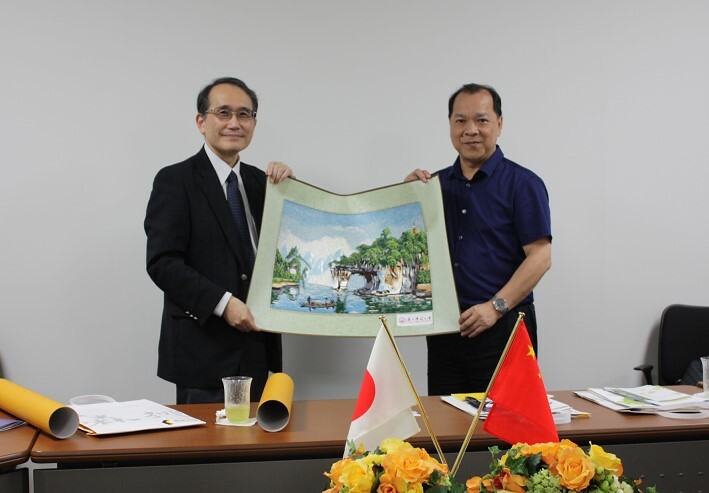 Students have been accepted for exchange between Kumamoto University and Guangxi Normal University since a cooperative agreement was established in 2005. During the discussion, opinions were exchanged on the initiatives of the College of Cross-Cultural and Multidisciplinary Studies at Kumamoto University, along with the current exchange situation and the promotion of future exchanges. The courtesy call ended harmoniously. Subsequently, we discussed the Student Exchange Program in further detail at the personnel level and continued to agree on the development of good relations between our two universities by promoting student exchange in the future. Afterward, a roundtable discussion was held with about 6 international students from Guangxi Normal University who are currently studying at Kumamoto University. They discussed their student life at Kumamoto University, and then they underwent a campus tour and deepened their interest in Kumamoto University. It is hoped that further promotion of exchange between our two universities will result from this visit.